We went to look at a house recently. A proper family house. The sort of house that would make me feel like a grown up. A house with a porch, somewhere to hang coats and put shoes (RIP shoe pile), an upstairs bathroom, and proper living space. Let’s call it the One Direction house, because, well, there were a LOT of posters. There are a lot of things I don’t love about our current place. I would love to have a kitchen that is more than just a glorified hallway. Room for a dishwasher would be nice. A fridge that can fit in the kitchen rather than the dining room. A staircase that isn’t so steep and child-unfriendly. A patio that isn’t a health and safety nightmare. There’s also the fact that it lacks the living space for a growing, energetic family. All the rooms are square and boxy. Far from open plan living, in winter we spend the majority of our day in one 3m x 3m room. And everyone keeps telling us that we “just can’t contemplate having three children in this house” (which sort of makes the fiercely stubborn side of me more keen to give it a go). It’s the want for more living space that will see us leaving this house eventually. But no matter how much we desperately crave the extra space, I found that my excitement level for the “exactly what we want” One Direction house wasn’t at a maximum. It wasn’t even close. I think it’s because we know we’d be seriously stretching ourselves to afford somewhere like that. And because starting down that thought process takes me right back to five years ago when we were attempting to buy our first place. Thinking about that time makes staying in our current house FOREVER seem a very good idea indeed. Looking back on being first time buyers when I still trying to come to terms with the HUGE unplanned, life-changing event that was becoming pregnant with Arlo, all the while knowing that we were on a pretty tight deadline to find somewhere to live before he arrived, still makes me shudder. It was a horribly stressful and uncertain time, and I NEVER want to do that again. 1. Talk to a mortgage advisor. Although we aren’t ready to move again just yet, we have spoken to a mortgage advisor who has given us some really helpful advice to action now. Even if you are saving to buy, but not quite there yet, it will give you a really good idea of what you are aiming for. A lot of advisors take a small percentage if you purchase a property with their help, meaning their advice is free before that point. It’s never too early to start working towards getting yourself in the best position possible in order to buy. 2. Credit card debt, student loans, repayment plans, all affect the amount a mortgage provider will be prepared to lend you. If Sam and I didn’t have our current debt (which is just your average student loan debt and a couple of credit cards), we would be able to borrow around £20k more. It doesn’t matter to the lenders that we can afford the repayments comfortably. And that amount is coincidently the difference in being able to upsize in our area or not bothering to move at all. Start paying off debts now, if you can, and think very carefully before blowing your credit limit on a holiday or buying that car on finance. 3. Is there a possibility, however small and distant it seems, that you might think about starting a family whilst in the property you are looking to buy? 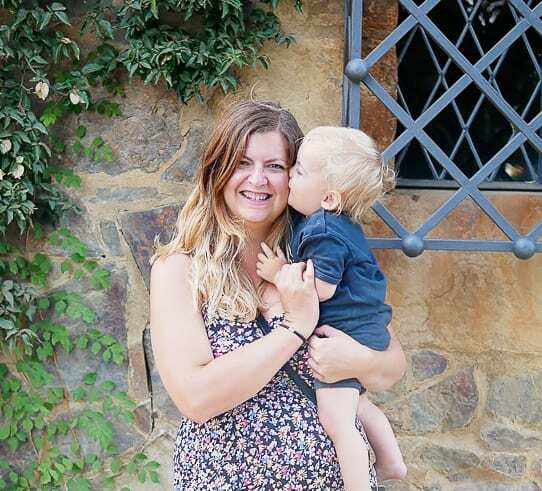 You may be budgeting your repayments according to TWO full time incomes right now, but think carefully about how the affordability might change if you factor in maternity leave and childcare costs. Could you still afford this place? 4. Is the property priced at the top of your budget, or is there room to manoeuvre if several offers are made at buying price or (eek) higher? The houses we are currently looking at in order to upsize are priced right at the top end of what we can afford, and I often worry about the likelihood of being outbid on our ‘dream house’ time and time again. 5. Do you have the time and money to carry out necessary work, or do you really need a place to be ready to move into? We were looking to buy our first house when I was eight months pregnant with Arlo. Looking back, I think perhaps we weren’t firm enough with the agents about what we really needed (I’m not sure WE really knew what we really needed as we were buying newbies and knew our budget wouldn’t get us anything perfect). We were absolutely stretched to the limits of what we could afford, and were not in a position to live in a building site, yet we kept being shown houses with a hole where the kitchen should be. My mum always maintained that we could live anywhere with a baby and carry out work as we go, as long as we had the basics – a rudimentary cooking setup, running water, and heating. But you also need money to make this happen. 6. Has the property already been double glazed, and if not, can you afford to upgrade the windows? Living without double glazing in an old house is not particularly fun or cost effective. Taking the steps to double glaze will be a serious consideration. Premier Windows have a clever quote feature, where you can send in photos of your property to get an exact idea of the costs involved. No need for a home visit or a hard sales pitch. 7. Do you have enough change left over for an emergency work fund? In the end, we bought a house that was completely ready to go. But the purchase took every last penny we had. We weren’t prepared for an emergency rot situation, which involved a hefty credit card debt that devastated our budget for the next two years. 8. Obviously, things don’t always go according to plan (surprise babies, yay). But, in an ideal world, don’t embark on a house hunt with a time limit. Being free of time constraints when you are looking for a property allows yourself proper time to sit back and THINK about your decisions, and there’s no pressure to find the perfect place before a certain deadline. Thanks to Premier for partnering with Sorry About The Mess. I really like your posts about your home/school choices/area/ finances etc. We live up north in Yorkshire and are currently looking to upsize before our eldest who is 3 starts school. I suspect london house prices would make our eyes water! Thank you. It’s one of the topics I like to talk about the most, but sometimes think it runs the risk of sounding a bit too spoilt/moany.